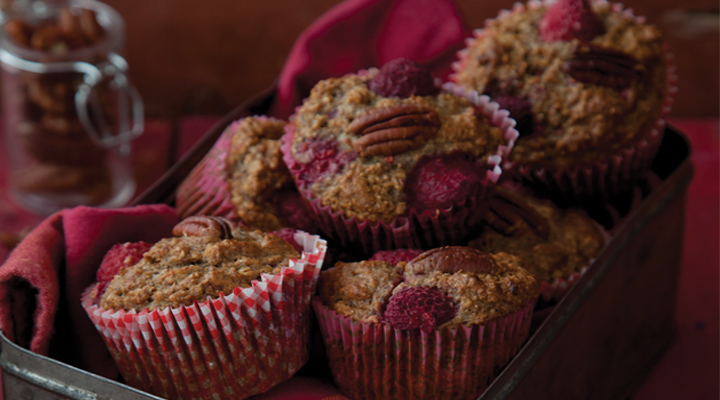 These muffins are sweetened only by the natural sugar in the fruit, making them a healthy treat for any time of the day. Omit the nuts if allergic or packing them in a school lunchbox. They are ideal for using up overripe bananas, which often tend to lurk in the fruit bowl. They are perfect for freezing and can be taken out the night before as necessary. Preheat the oven to 180°C/gas mark 4. Line a 12-hole muffin tin with muffin cases. Mash the bananas really well in a large jug. Add the yogurt, oil, eggs and vanilla extract and mix to combine. Place the flour in a large bowl and add the oats, cinnamon, baking powder and baking soda. Reserve 12 of the nicest-looking pecan nuts (if using) and finely chop the rest, adding them to the bowl. Toss everything together and make a well in the centre. Pour the wet ingredients into the dry and mix together. Finally, stir in two-thirds of the raspberries. Spoon the batter evenly between the muffin cases. Scatter the remaining raspberries evenly over the tops and press them in lightly. Sit a pecan nut, pretty side up, in the centre of each one. Finally, scatter the extra oats over to decorate. Bake in the oven for 25 to 30 minutes, until risen and cooked through. Remove and leave to cool a little.